Are you looking for Vodafone Off Campus 2018-2019 Drive? then you are in the right place. Vodafone has now disclosed that it is conducting an off-campus drive all over across India in various locations such as Hyderabad, Cochin, Chennai, Mumbai, Delhi, Pune, Ahmedabad, Kolkata, Gurgaon, and Noida. So, the 2018 and 2019 Passed Out Candidates who are willing to apply for can now apply through online. We suggest the aspirants that refer to the whole article for the details of Vodafone recruitment. Moreover, Vodafone is announcing the jobs for both freshers and postgraduates. And, Vodafone online registration is now available through this article. Therefore, the candidates who are willing to take part in the off-campus drive can check Vodafone careers. Equally, you need to practice the test papers to clear the interview. Moreover, Vodafone is now hiring graduates, postgraduates, management students, diploma candidates, and others. Furthermore, this is a golden opportunity for those people who are willing to join an IT industry. 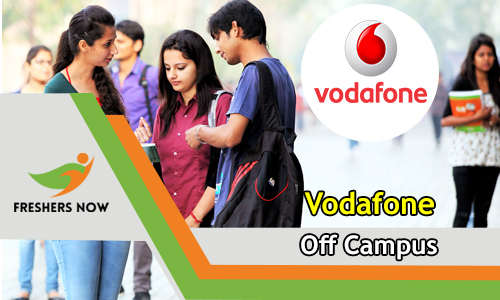 Vodafone Off Campus 2018 is now seeking for the vacant posts. Moreover, we can say that Vodafone has brought you a golden opportunity at your fingertips. Therefore, the candidates who are interested can now apply for Vodafone Off Campus 2018. Vodafone is a British multinational telecommunications company, with headquarters in London. It predominantly operates services in the regions of Asia, Africa, Europe, and Oceania. Among mobile operator groups globally, Vodafone ranked fifth by revenue and second (behind China Mobile) in the number of connections (469.7 million) as of 2016. Its Vodafone Global Enterprise division provides telecommunications and IT services to corporate clients in 150 countries. Vodafone has a primary listing on the London Stock Exchange and is a constituent of the FTSE 100 Index. It had a market capitalization of approximately £52.5 billion as of 10 February 2016, the eighth-largest of any company listed on the London Stock Exchange. It has a secondary listing on NASDAQ. Every great brand stands for something and at Vodafone, they exist to connect everybody to live a better today and build a better tomorrow. At Vodafone, the people live the brand. Working at Vodafone is all about helping people feel ready to benefit from new technology. They bring the future to even the most remote places, using technology to help families in disaster zones, showing young people that a phone is not just for fun and thinking about technology that doesn’t even exist yet. Over 30 years ago, we made the first ever mobile phone call and sent the first SMS in Britain and have been changing the lives of billions of people ever since. Therefore they are taking 4G to the Moon and using big data for social good to intelligent transport systems and emergency drones, they are still shaking things up. Moreover, they believe being different is good. Furthermore, they’re proud to offer equal opportunities regardless of race, nationality, cultural background, gender, age, marital status, sexual orientation, gender identity, disability, religious or political belief. Moreover, they can only leverage this diversity by building an inclusive culture where everyone is respected, can be themselves and strive to be their best. Therefore, your different perspectives help us to shape the future. B.E, B.Tech, BCom, M.Tech, MBA, MCom, MSc etc., should have the minimum aggregate of 65 % in their 10th standard, XII standard, Graduation and Post Graduation. The work experience should not be more than 3 years. The age limit should be 18- 28 years. Therefore, the candidates with backlogs are not eligible for the drive. Hence, we suggest the candidates clear their backlogs before their academic career. They should be excellent in verbal and written communication skills. Good Knowledge of Operating Systems, Hardware, Networking, and MS Applications. Equally, they must have Multitasking and coordination skills, having the ability to work with a Team Player. Fluency in English, written and verbal. Furthermore, they should have Good knowledge of Microsoft Office Suite. Moreover, freshers, Experience and Full-Time course candidates are applicable. Information Systems, Computer Science, Mathematics, Physics degree or other equivalent degrees in technical disciplines are required. Moreover, there should be an ability to creatively apply technology to solve customer problems. And, now you have to click on the “Careers”. Hence, we want to conclude that if you are willing to apply for Vodafone Off Campus 2018-2019 Drive for Freshers, Online Registration then you might check our whole article and details of the company and apply through the link given above. Stay tuned to FreshersNow.Com for more updates.